Now that I’ve got my hands on a Garmin Vivoactive, I was curious to see how it differs to the Apple Watch Sport. Is Garmin still the go-to brand for exercise tracking or is a well marketed Apple Watch now a serious challenger in the exercise industry. Here’s the 10 biggest differences I saw between the two releases. #1 -The Vivoactive has GPS. The Apple Watch Does Not. It’s the biggest difference from an exercising angle in my opinion. The Vivoactive will let you measure your distance accurately without the need of your phone. 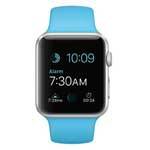 All Apple Watch devices use the GPS within an iPhone to feed back accurate distance metrics. This is fine if you want to go for a bike ride, but I just think going for a run holding a phone is more hassle than its worth. If you like to exercise with music in your ears, the Apple Watch has up to 2GB storage for tracks on the device itself. This is much better than the Vivoactive which only lets you use the Bluetooth functionality to remotely control the playlist that’s on your smartphone. Similar to the GPS situation, it’s an issue for athletes who want to workout phone-free. Apple Watch may have extra benefits, in that I can see music streaming apps launching their services to a watch face; giving these users access to more songs as they exercise. Could a Spotify Offline mode exist on an Apple Watch? Pure speculation but it could be possible. #3 – Apple Watch has way more 3rd party sports apps! It’s not just music apps where the Apple Watch will trump Garmin either. 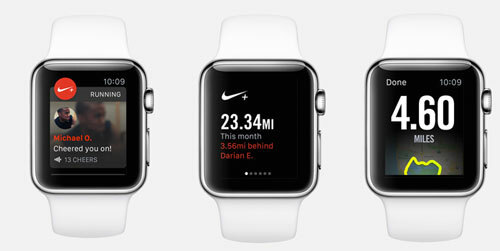 At launch, the Watch Sport already has Nike+ Running and Strava delivering exercise apps on the platform. Nike+ can give you real-time cheers from your Facebook friends as your biking round the countryside. The Strava app can give you real-time elevation gain and segment updates as you ride. Upon finishing your activity, your online accounts of the sports app you already use will be updated. 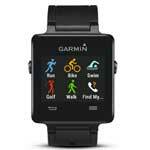 In Garmin’s defence there are decent apps which already exist on the watch; swimming, cycling, golf and running. These work perfectly with Garmin Connect, and the data from there can be synced with other 3rd party profiles like Strava. The Vivoactive uses a new platform called Connect IQ, which so far has some useful apps which make the most of the data collected by the watch. Some apps profile your steps or heart rate so you can see a more trended view over time (I’ll cover the best Connect IQ apps another time). I think its going to be difficult for Garmin to compete with Apple on this front, even for specialised sporting apps. When you realise that Windows Phone which is used by millions doesn’t get app support from many third party app developers, I can’t see companies investing resources into Connect IQ. #4 – Apple Watch struggles to last 24 hours. Apple tests have concluded users will typically squeeze up to 18 hours usage from a single charge. This is limited further when listening to music or taking heart rate down to just 6.5 hours! The Vivoactive is reassuring with 10 hours battery when using GPS, and up to 3 weeks when not. 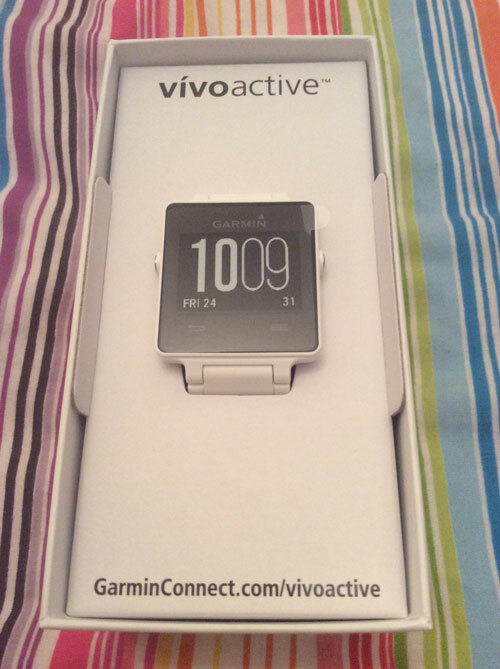 #5 – Vivoactive can’t capture heart rate from the wrist. The Apple Watch has a built in monitor on the underside of the watch. Recording pulse rate from the wrist, makes tracking general lifestyle tracking extra convenient. Apple records pulse when you request it to, either as a glance or when you’re in activity tracking mode. The Vivoactive needs to be connected up to an ANT+ heart rate monitor. This is sold separately, unless you buy the bundle pack which will cost $50 more. These are usually worn around the chest, and can be great for when exercising but not so much during your daily routine. I would recommend you decide how important this feedback is to you before deciding on a purchase. Apple Watch will be adequate for lifestyle, but Garmin will give you the more accurate exercise data. #6 – You can’t swim wearing the Apple Watch. If you do, it’ll be one expensive mistake! The Apple Watch has a water rating of IPX7 which is incidental exposure of up to 1 metre for up to 30 minutes. Apple’s own small print on their product page states..
Apple Watch is splash and water resistant but not waterproof. You can, for example, wear and use Apple Watch during exercise, in the rain and while washing your hands, but submerging Apple Watch is not recommended. Garmin’s Vivoactive is lengths ahead, which has a swimming app pre-installed which tracks time, distance and count strokes. Built with a water rating of 5ATM, the watch should hack open water swimming and shallow snorkelling without damage. High speed watersports and deep diving are not recommended though. 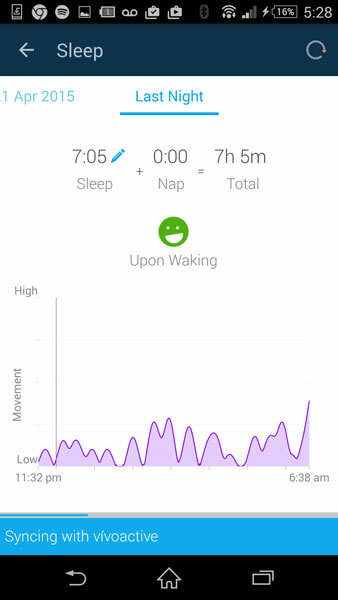 #7 – Sleep tracking on Vivoactive. The shorter battery life on the Apple Watch may be a factor into why it hasn’t been designed with a sleep tracker, after all who would want to lose half of their battery life before the day has begun! Garmin’s wearable has no such problem, and can automatically monitor your sleep movements. After spending a night with the Vivoactive, I got the results below. It’s a little basic in outputs, a graph which shows periods of high movement and how long you were asleep for. I didn’t input the times I went to bed, so I’m impressed it picked these up so accurately. If you’re into filming your exercise, the Vivoactive has ANT+ connectivity, meaning it can be used as a remote for the Garmin Virb. Pausing and recording video footage from your wrist is much more convenient if your camera is attached to your helmet whilst your riding a bike or skiing down a mountain. Apple Watch can be used to take photos from an iPhone, but that’s more for group shots rather than filming epic sporting footage. For the cycling enthusiasts this ANT+ connectivity can be paired up with speed & cadence sensors allowing the Vivoactive to blend this data with your GPS and speed for more accurate interpretations. Another advantage of the Vivoactive is that its compatible with many Android phones too. Just download Garmin Connect from the Google Play Store and you can put it on most phones which were released later than 2013 and are running Android 4.3 (Jelly Bean). If you own a Windows Phone, then I’m afraid neither of these watches will sync with your device as there isn’t the app on the Windows Store. Maybe take a look into the Fitbit Surge. Sometimes the only difference which matters is how much you pay for it. The Garmin Vivoactive is reasonable at $249 on its own or $299 with the heart rate monitor. It’s about the same price as a Forerunner 220 but with added smart functionality. The starting price of an Apple Watch Sport is $349, you have to fork out an extra $50 if you want the larger 42mm screen. Personally, I think its too steep for a sports watch which lacks GPS, though if you’re going to use it for than fitness tracking it may be worth it for the apps and entertainment features. The Apple Watch Sport has potential, but from an exercise standpoint I think the hardware isn’t up to the same standards as a Vivoactive. Give it GPS, a 24 hour battery life, and sleep tracking and a future release (Apple Watch 2?) could be a worthy sportswatch purchase for an athlete. What are your thoughts on the Apple Watch Sport vs Garmin Vivoactive?